The slumber parties at our house growing up were always unique, and there was one activity in particular that none of my friends ever did anywhere else but at our house. 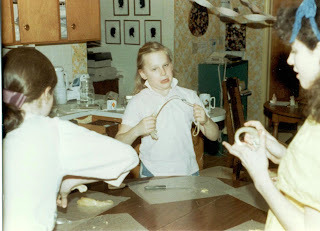 When the night was getting late, things had started to die down, and we were scrambling around for something to do next, my mother would be in the kitchen cooking up a batch of vinegar taffy for us to pull. Each of us was given a little portion of candy to make into a masterpiece. We pulled and pulled until the gooey, translucent stuff magically turned into something opaque and hard that could be twisted into pretty little candies and taken home to share with parents. There was of course, lots of laughter and talking that went on during the pulling stage as everyone compared notes on their taffy progress. Sometimes the taffy didn't set up right, but that was never too disappointing. The experience was the fun part. Set out a sheet of wax paper for each puller. Put about ½ teaspoon butter in the corner of each sheet. Cut pieces of wax paper (about 3 inches square) to be used in wrapping finished taffy. Lightly butter the sides of a heavy kettle. 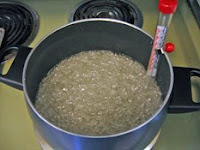 Bring mixture to a moderate, steady boil that bubbles over the entire surface. Without stirring it, pour the mixture onto the lightly buttered jelly roll pan to cool to temperature that can be handled without a lot of discomfort. (It should still be very warm) This may take 10 or 20 minutes. Cut into portions with kitchen scissors or sharp knife and put on each puller’s wax paper. Pull taffy until no longer clear, but a whitish opaque, very stiff and hard to pull. Twist taffy (too make it pretty) and lay it down on the wax paper. Cut into 1 inch pieces. Kitchen scissors work well. Wrap them in the little pieces of wax paper. This activity might take me into the next level of Supreme CoOp Hostess for our next homeschool CoOp get together! :) Thanks for sharing...we'll have to try this!